BBQ Rub Smoked Deluxe mixed Nuts. Perfect for all of your Holiday Gatherings. ‘Tis the Season of Giving, Joy to the World, Chestnuts Roasting… Yada, Yada, Yada. Our superhero TasteeBQ doesn’t begin his Holidays Celebrations in September (Like many Retailers. Next year they will be starting in August). Like many of us, the Holiday Spirit doesn’t usually take him over until the final shopping weekend before Xmas. This year he was planning to gift- to family and friends- his favorite, most essential Grilling accessory: Coal. But something told him that it wouldn’t be received in the spirit intended. So TasteeBQ had to come up with another plan. 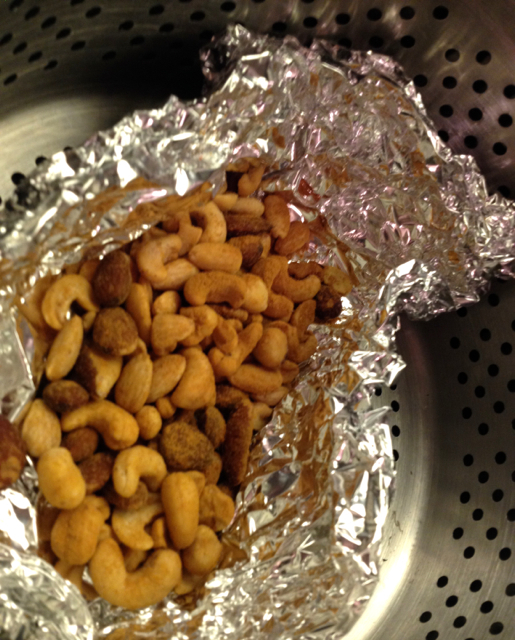 He was sprinkling BBQ Dry Rub on his Deluxe Mixed Nuts, and preparing to cook them on his sunny California Smoker. Then, TasteeBQ got Zapped with a sudden burst of inspiration. He began to think about all of the unfortunate Boys and Girls throughout the World who are not privileged enough to live in California and have access to Grills from Webber, Char-Broil or the Big Green Egg- yearround. Some people even live in Apartments. While others may not be able to excavate their BBQ Rigs from “Let it Snow” Land. More interactive than those screechy Musical Holiday Cards, he decided to bestow the Gift that keeps on Giving: The DIY Stovetop Smoker (STS). Ta Dah!~ Homemade DIY Stovetop Smoker(STS) in action. That “steam” you see is actually Mesquite Wood Smoke. 1- Bag of Mesquite of Hickory Wood Chips from the .99 Cents Only Store. Place Wood Chips in foil basket at bottom of Pot. Less than 1/4 Cup is fine. Before you run out to grab a Whole Hog or 50lb. Chicken, bear in mind that this technique works best for small portions of Prepared Foods. Stovetop Smoking is a quick and easy way to infuse real Natural Wood Smoked Flavor, without leaving your Kitchen. Chefs have used similar techniques for decades doing indoor Tea and Herb Smoking, with Fish, Potatoes and other Veggies. TasteeBQ has just began to experiment with translating it to BBQ. So far the results are simply delicious. [Others have also discovered this technique, see Links]. Place Steam Pan or Rack over Wood Chips Pouch. 1. 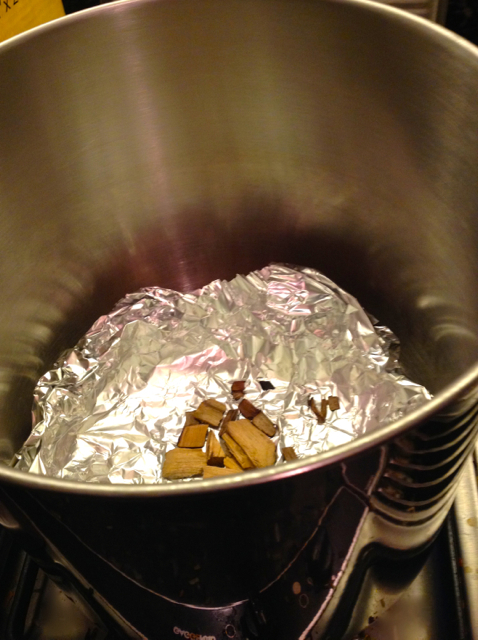 Put Pot on Stove, with small foil pouch of dry Wood Chips (no more than 1/4 Cup) placed in the center. 3. 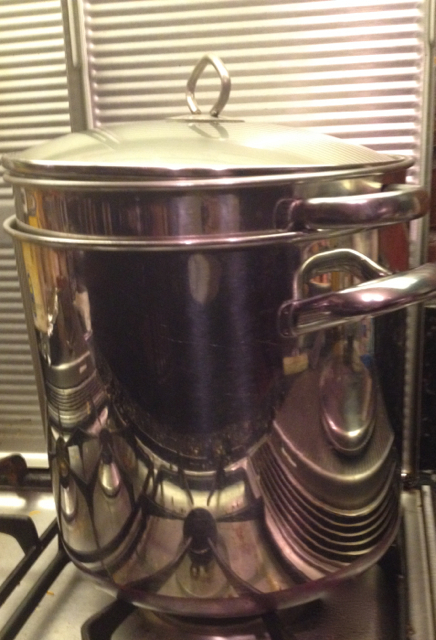 Cover Pot with Lid (leaving small vent) and turn burner to High. You should start seeing smoke in 3-5 Minutes. From there it depends on what you are Smoking. Let’s experiment together. 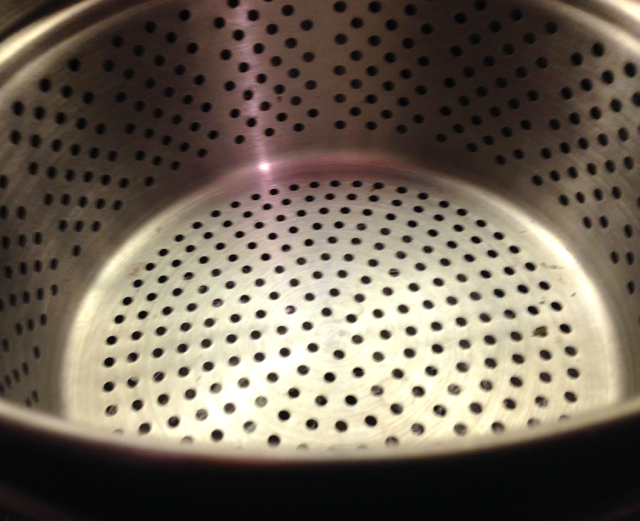 Maybe we can compile 100+ DIY Stovetop Smoker (STS) Recipes in time for the next Super Bowl. Many of you will still be in the snow, so it should work out nicely. BBQ Rubs Seasoned Deluxe Mixed Nuts are placed on Steam Pan. Mixed Nuts as Smoking starts. A Clear Glass Lid gives you the advantage of monitoring Smoke Levels without lifting lid. Here are some Suggestions to try, followed by our first 2 DIY STS Recipes. Place Food on open foil tray, preseason with BBQ Rub, or seasoning mix of your choice. Once lid begins to smoke, close lid. Cut heat to medium for 2-3 Minutes, then cut off. Leave food in closed chamber for 10-15 minutes (until smoke dissipates. In case of emergency, always have a fire extinguisher in your kitchen and pre-clear a path to an outside door or window where you can release smoke. * An built-in intake system is even better. *This shouldn’t happen if you stick to less than 1/4 Cup of Wood Chips and turn off burner in regular intervals while cooking, or every 15-20 minute Smoking Cycle. Start with above instructions. The idea is to warm it through on your DIY STS. Pre-warmed or room temperature food will absorb smoke faster, so it could be good to go after only one Smoking Cycle. Cold leftovers may take 2-3 Cycles. TasteeBQ has recently learned that he is not the first, or only one to think of this Stovetop Smoking technique. A quick web search found blogs as old as 2012. Most of them suggest to STS the meat on low for up to a couple of hours, then finish in the oven. This will also provide a milder flavor. The other way is also fine- cook Meat first, then set it in the STS for a Smoke Cycle or Two. Links to referenced Articles appear below. Smoked Deluxe Mixed Nuts seasoned with POWER by California Gold BBQ Rubs. Great for Holiday and New Year’s Gatherings. 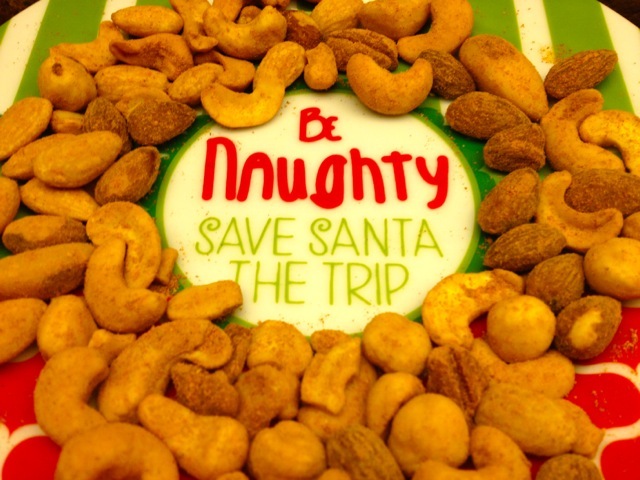 Also works with Cashews, Pistachios, Almonds, Walnuts or Peanuts. 2. Place in Foil Pouch, then into your STS. 3. 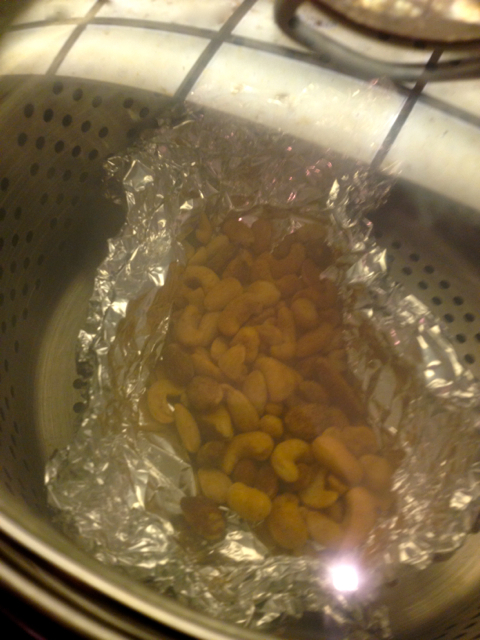 In only one Smoke Cycle, Nuts will come out tasting warm and delicious. Won’t last long, at all. “Next Day” Salmon smoked in Stovetop Smoker for 2 Smoke Cycles. Season with POWER Rub, over Cheesy Garlic Fettuccini. 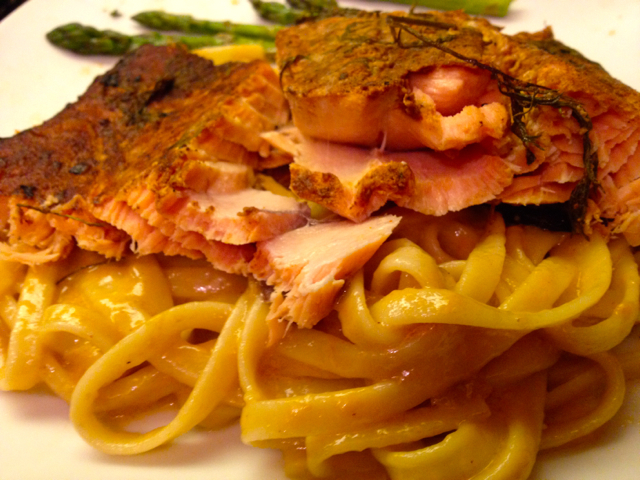 This a great “Next Day” Recipe for leftover Grilled, Baked or Smoked Salmon. We served ours over a bed of Cheesy Garlic Fettuccini. 1. Place Portion of Salmon on Foil. Spritz with water or Citrus Juice to help maintain moisture. 2. Re-season Salmon with BBQ Rub or Spices and Herbs. 3. Cook on STS for 1-2 Smoke Cycles until warmed through. Finish with Tzatziki Sauce with Dill or Garlic Herb Seasoned Butter. Fill out this Brief Contact to receive STS News , Updates on 100 DIY Stovetop Smoking Recipes or if you’d like to share STS Recipes.